The markets receded to levels not seen since March of 2007 and the Fed failed to ride to the rescue. We know the Fed is not responsible for the equity markets but their economic moves do provide support. That support was sorely lacking and the markets reflected it. The Dow hit 12022 intraday and that represents a drop of -1,758 points from the December highs of 13780 and a -2,176 point drop from the October highs. That is a 15% correction for the Dow but that is not the biggest index loss. The Russell-2000 has fallen -21% from its highs and is now firmly in a bear market. Small caps have the highest risk in a recession and fund managers have been fleeing this risk since late December. 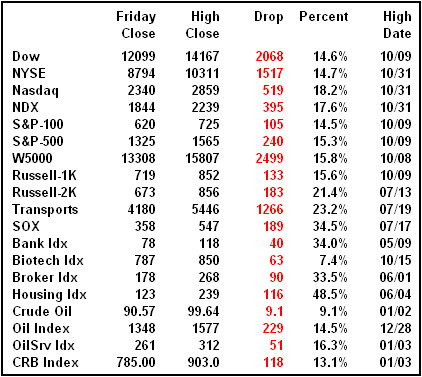 In the correction table below you can see the indexes and sectors most impacted by the drop. Housing, banks, brokers and chip stocks have been decimated. Small caps and transports were the next hardest hit with the large cap indexes generally losing around 15%. Last week was the worst week for the S&P in more than 5-years. It has been the worst start to a new year ever. Just looking at this table you would think we were due for a bounce. It is even more amazing when you realize it occurred in little more than two weeks. Last week was a busy week for economics and those negative numbers were responsible for much of the market drop in the table above. 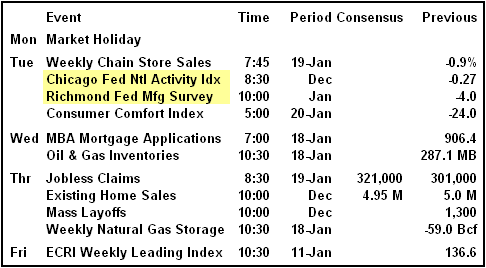 Next week the economic cupboard is bare with only two reports of minimal importance on Tuesday. Those regional activity reports are not expected to show anything different and would only be noteworthy if they surprised to the upside. 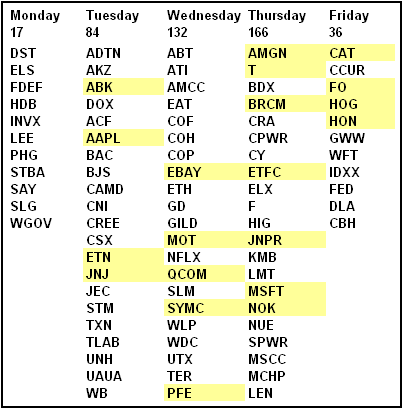 Next week will be a very heavy earnings week with close to 450 companies reporting. These earnings reports or more importantly their guidance for 2008 will be critical for market direction. The challenge is the environment. With all the whining about the impending recession there should be a lot of cautious guidance. Think about it. If you are the CEO of a public company with exposure to the U.S. economy then you want to be cautious in your guidance. The street expects it and for you it is a get out of jail free card for the next quarter. If you guide cautiously lower next week then beat your estimates in March you are a hero. It is a win-win scenario. This suggests guidance could be weak and that could weigh on the markets. The bank stocks continue to drag the overall S&P numbers lower on a daily basis. Q4 earnings in the financial sector are now expecting to fall -99% over the same period in 2007. The entire sector is only expected to post earnings of $586 million compared to $55 billion in Q4-2006. It is hard to comprehend the damage to the financial sector with individual firms losing billions each. Those headliners are erasing the gains by the rest of the sector. Next week the focus will be on the tech stocks led by Apple, Ebay and Microsoft. There are quite a few chip stocks, roughly 10 or so, and that will help tech investors determine the health of the tech sector. On this calendar I put the number of reports at the top of the column and then listed just a few of the higher profile names. I highlighted those I thought would be important to market direction. Apple reports on Tuesday and analysts are expecting great things. Possibly the expectations are too great as we saw surrounding the MacWorld presentation by Steve Jobs. Analysts are expecting sales of 2.2 million Macs, 24.7 million iPods, 2.26 million iPhones and $1.59 in earnings per share. Apple is expected to crush the earnings number and then give cautious guidance. It is what they always do. However, this time they may have reason to be more cautious. Verizon's iPhone competitor is selling very fast and is lowering the price point for that type of product. Motorola's iPod competitor is also taking market share from Apple. This will only increase as more companies expand their competitive product lines. I think we should expect Apple to guide lower on margins but the products are still too new to guide lower on sales. They are still breaking into new markets and Apple will be the leader in those markets simply due to brand recognition. The other products will come later and eat away at Apple's initial market share. Microsoft is expected to post earnings of 46 cents powered in part by total sales to date of 17.7 million Xbox consoles with 1.26 million sold in December alone. Software sales are also expected to contribute strongly with more than 100 million copies of Vista already sold. Microsoft is reportedly taking back ground in the piracy battle and all their latest software releases now limit the number of times they can be installed. I got an Office 2007 package this week and it is limited to three installs. That means you will not be loaning the CDs to your brother-in-law or next-door neighbor but keeping them yourself and saving those installs for your next computer upgrade. Master them with Hotstix QQQ Trader. We'll show you exactly when to buy and sell the QQQQ and turn you into a master trader who knows how to cut your losses, nail short term gains and rack up some incredible profits. EBAY reports on Wednesday and although it has been posting some strong results most analysts only expect Ebay to meet estimates and possibly tighten forward guidance. The slowing economy could prompt more people to try and raise cash by selling on Ebay but it also reduces the number of buyers willing to take your junk off your hands. Expectations are for earnings of 41 cents. I am an active Ebay power seller and I have noticed a slowing of bid traffic and a lower ticket price for things that have been selling. Ebay also ran several special promotions late in Q4 to try and pump up auction listings. Things like free gallery pictures and drastically reduced insertion fees. I don't recall the same frequency of special deals over the last several years so they may be seeing a slide in traffic and revenue and need to induce sellers to list more items. Ebay is facing increased competitive pressure by Amazon and Google. The Google checkout process is stealing business from PayPal. Google is not currently charging a fee for that service compared to a roughly 3% fee on PayPal. This is a promotional move by Google to build market share and will switch to fee based on Feb-1st. Ebay is expected to announce lower fees to offset these competitive pressures when they report earnings. I would be concerned about holding any Ebay position over their earnings report. GE reported earnings on Friday that were basically inline with estimates although the revenue number was a little lighter than expected. GE is seen as a proxy for the economy and GE chief Jeffery Immelt said the U.S. was a tough market. GE said the global infrastructure was very strong and would help smooth out any weakness in the U.S. economy. GE affirmed guidance for 2008 of $2.42 per share but it was slightly less than what analysts had expected. Still, the affirmation allowed GE stock to post a $1.10 gain for the day. Ambac (ABK) received another blow on Friday that could impact not only its survival but also cause further pain in the financial sector. Ambac is a bond insurer that guarantees payment to bond holders in case of default. Fitch Ratings cut it's rating on Ambac on Friday to AA from AAA. This downgrade likely means Ambac is out of the underwriting business. The reduction in rating under AAA causes a revaluation problem for any institution, especially banks, that currently holds this paper. These assets have already been eroded by the market and now with the insurance dropping out of investment grade status their value will erode even further. Some banks have bylaws that will require the bonds to be sold and in the current market it would be a fire sale prices. Merrill took a $3.1 billion write down after ACA Capital Holdings was similarly downgrades to junk status. Competitor MBIA (MBI) currently has an AAA rating and after Friday's move on Ambac it could be in for a downgrade of its own. The downgrade of these underwriters means many municipalities will no longer be able to sell bonds at a competitive rate to finance projects. Many smaller entities like schools and hospitals rely on these underwriters to provide them respectability and access to capital markets. If you have weak credit you could pay a company like Ambac to insure your bond. With their AAA credit behind your bond you got AAA rates and ready buyers. The difference in rates more than offset the cost of the insurance so everybody was happy. Basically they were renting their AAA credit rating. Now their ratings are falling off a cliff. ACA has already been cut to CCC and junk status and nobody will pay to use their credit. Warren Buffett is looking to ride to the rescue of those municipalities with his new AAA rated insurance business. I believe he saw the handwriting on the wall for ABK and MBI and jumped into the sector. Buffett's new firm has the added benefit of having no bad loans on the books and that is something the others can't say. His new company should be very busy for the foreseeable future. There is a serious concern that should these insurance firms go under, and that is clearly possible over the next few weeks, the financial sector could lose another 50% in value due to devaluation on their bond investments. This is going to be a serious factor to watch next week. ACA has only $425 million in capital left to cover $69 billion in bonds they insured. They are already under state control and will likely go out of business. Ambac has fallen from $95 per share to $6 and a market cap of $629 million. They were planning on doing an equity offering to shore up finances but the $1 billion they were planning to sell became too costly and too dilutive for existing shareholders. The plans were canceled last week. Ambac has insured $556 billion in debt. The odds of any of it actually being paid in the event of a default are zero. Now more than 137,000 institutions that insured their bonds through Ambac will see their interest rates rise significantly because of the ratings cut on Ambac. Moody's said it was going to review MBIA and you can bet their credit will be cut as well. MBIA (MBI) recently raised $1 billion from Warburg Pincus and sold another $1 billion in notes at 14%. They have fallen from $70 to $8 since October and now have a market cap of only $1 billion. Their exposure to mortgage backed bonds, CDOs and CDO derivatives is more than $68 billion. Those notes they sold last week are already trading at 70 cents on the dollar. It is almost a certainty that Ambac, MBIA and ACA will go under and any bond insured by them, over $656 billion in total, will have to be written down by the bondholders. Let's see, we have already seen about $60 billion in write-downs by the major firms. Once these insurers actually go under that number could quadruple very quickly. Since most of those bonds will eventually pay out it is not a 100% write-off but they must write down the value to whatever level the credit of the underlying borrower will bear. If they are a junk credit then the bonds go to junk and get valued at something around 35-50 cents on the dollar or worse. This is a story that will be around for a long time. Under Armour (UA) lost 35% over the last two days after saying on Wednesday they purchased a full 60-second commercial during the Super Bowl. The nearly $5 million cost for the ad equates to a majority of their advertising budget of 12% of annual revenues and the cross trainer shoe they will advertise will not even be available until May. Downgrades were flying with the majority of comments as "bad timing in a weakening retail environment." This is a huge risk for a product that will not be out for months after the ad runs. The next day UA warned that their profits for the first half of 2008 would be in the range of 3-5 cents when analysts were expecting 39 cents. The various economic events of the week combined to make bonds the preferred investment and push the yield on the ten-year note to 3.65% and a new 4.5-year low. The recession fear is spiking almost daily with Intrade.com seeing their recession contract rising to 73% chance of a recession in 2008. Volume was very strong with over 10,000 contracts traded on Thursday. The Fed Funds Futures are still showing better than a 136% chance of a 50-point rate cut at the January 29th meeting. Quite a few analysts expected that rate cut last week but so far it has failed to appear. Bernanke appears to be playing chicken with that recession locomotive headed straight for him and he is putting off the rate cut until the last possible moment. The Fed still believes the U.S. will avoid a recession but that is definitely a minority view. The inflation numbers for the week saw the Consumer Price Index (CPI) rise another +0.3% to an annualized headline rate of 5.6%. The core rate increased slightly to 2.4% and right at the upside edge of the Fed's comfort envelope. However, the risk of recession should be outweighing the risk of inflation and Bernanke has no reason not to cut rates quickly. It appears he is using the tried and true tactic of talking the real rates down without actually rushing to lower the actual Fed rate. With the yield on the ten-year at 3.65% and the current Fed rate at 4.25% that tactic appears to be working. Unfortunately it is not helping the market. Volatility is spiking back into the upper 20s and levels seen in the August and November bottoms. The market is running on fear and we know these things tend to get overdone before they end. The option expiration on Friday helped to increase the volatility and there is the potential for it to climax on Tuesday. Monday is a market holiday. With the expiration of options on Friday all those traders holding January puts for insurance are now uncovered. According to Jon Najarian the number of puts being purchased in the February strikes was far outweighed by the expiring puts in January. This means traders will have to do a gut check on Tuesday morning and decide if they want to be long or short and if the market is going up or down. If they think the market is going lower then they are more likely to sell on Tuesday rather than buy more puts. This could be the selling climax we need to see to create a new buying opportunity. There will also be a lot of put writers who will wake up with new stock in their accounts on Tuesday morning from exercised puts. Those traders will hit the sell button at the open to unload that unwanted stock. The internals are getting progressively worse and suggest we are building to a selling climax. It should also be noted that option expiration also impacted the negative internals so we can't apply too much weight to the data but it is very negative. Note the rising number of 52-week lows and the extreme volume levels. Regardless of the reason this is a very oversold picture and suggests at least a temporary relief bounce soon. 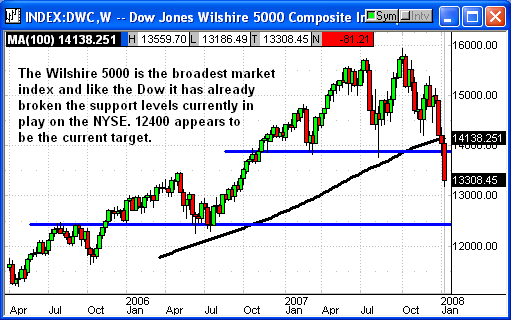 The Dow lost -507 points for the week and came to rest right above the support at 12,050 dating back to March 2007. In theory this should be a decent support point and the launch point for a potential rally. Unfortunately the rest of the indexes are not in agreement. The Dow may be the most visible index but it is not the most representative of the broader market. We normally use the S&P-500, NYSE Composite and the Russell 2000 for market direction predictions. Were it just up to the Dow I would be calling for a rebound today. The dead stop at 12,050 support is exactly where you would expect a rebound to appear. If that level fails it is going to get very ugly very quickly. The market takes the stairs when moving up and the elevator when moving down. If the Dow breaks 12,000 it could be the express elevator to the basement at 10,700. The Nasdaq chart also came to a dead stop on substantial support at 2340. 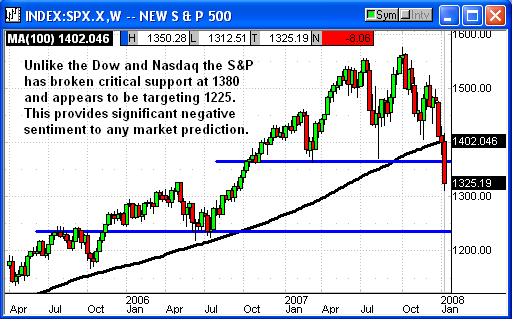 Were it up to just the charts of the Dow and Nasdaq the odds would be good for a rebound next week. 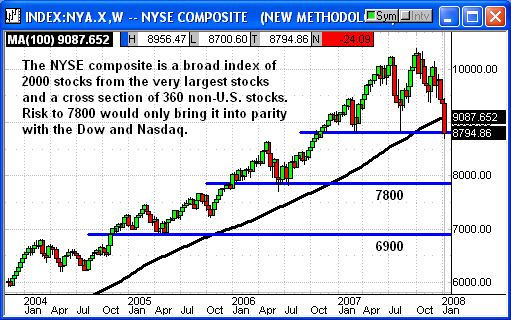 Should the Nasdaq break support here it could be a long drop to something in the 2000 range. That would be a whopping 30% drop from its highs. With potential earnings problems from AAPL, EBAY, QCOM and a dozen chip stocks next week it will be up to Microsoft to hold the line. I am not sure Microsoft can pull it off and they don't report until Thursday night so the week will be 80% over before they can help. 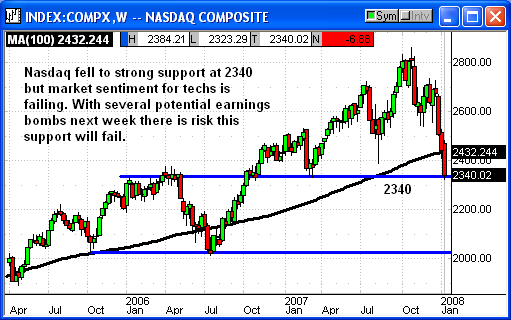 To put it bluntly I am afraid we could see some lower lows for tech stocks. The S&P-500 chart clearly shows the support break at 1380 and a potential target of 1225. This chart is more bearish than the Dow and Nasdaq and is colored by the 21% weighting of the financial sector in the S&P. With the rating downgrade on Ambac and the likely downgrade on MBIA the financials are going to be in the house of pain. That will make it tougher for the techs to mount any kind of S&P rally. The small caps have been decimated over the last two weeks and there appears to be no end in sight. The small caps are the sentiment indicator for recession fears. Their liquidity limitations and tendency to perform poorly in recessionary conditions have fund managers fleeing them in large numbers. As a sentiment indicator for the economy and the market this is a flashing warning that the bear is not dead. If current support at 675 fails we could easily hit 600 and that would be a 30% correction from the highs. The NYSE Composite is composed of just over 2000 stocks that trade on the NYSE. That includes 1600 U.S. stocks and 360 non-U.S. companies and a large number of ETFs. This index is highly correlative to the overall market although the inclusion of the non-U.S. components tends to make the NYA outperform the other indexes in times of U.S. market stress. The index components have more than $18 trillion in market cap. The $NYA (ETF is NYC) has returned to initial support at 8800 but the odds are very good that support will not hold. The Dow, S&P and Nasdaq have already broken through their corresponding levels and any further decline should push the NYA into free fall to retest 7800. Moving out to the broadest measure of the market the Wilshire-5000 we see that the corresponding support levels on the NYSE Composite have already been violated on the Wilshire. Using the Wilshire as a market guide suggests we could see lows somewhere in the 12300-12400 range. It is tough to read those charts above and not let your bias color the outlook. The bears would be convinced that every current support level is about to be crushed by the next negative news event next week. 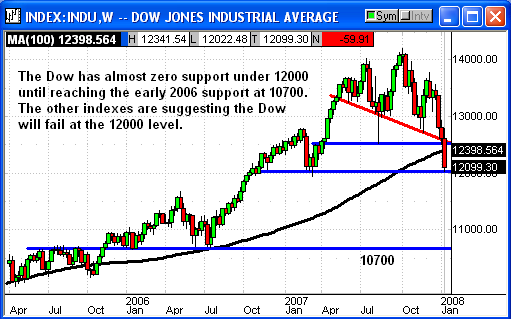 The bulls believe that Dow 12,000 is going to hold and the mother of all rebounds is about to appear. This is why we let the markets tell us where they are going. Last Sunday I suggested putting your market bias on the shelf and going long over 1400 and short at 1375. That short was 50 points higher than Friday's close and would have been a great trade. The S&P has risk to 1225 and that is another 100 points lower. The Dow and the Nasdaq are resting on critical support at 12050/2340 and while I would like to believe they will rebound from there I think there is more pain in our future. Again, like last week we need to let the market dictate direction. One point in the bulls favor is the Russell at 675. I mentioned about 3-weeks ago that 675 would be a buy level for me on the Russell using the IWM ETF. So far we have not seen any signs of bottom fishing at that 675 level and a break there would target 600 and that would be a screaming buy assuming the economy was not in a full-blown recession. 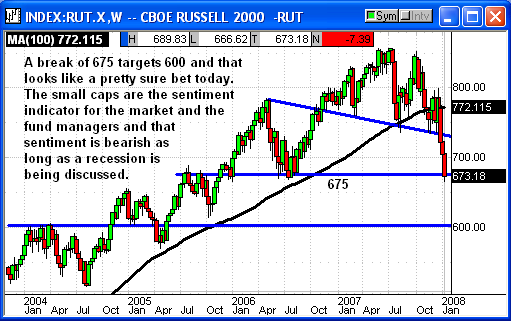 How the overall market reacts next week will depend a lot on how the Russell handles that support level at 675. With the S&P well away from any material support/resistance level I am going to use the Russell at 675 as our key indicator for the week. You should already be short from SPX-1375 and we should remain short on any continued drop below that Russell-675 level. However, if a bounce develops on the Russell we want to reverse to a trading long over 675. We could see a lot of post expiration volatility on Tuesday so be prepared for some market indecision around that level. There is a strong possibility of a market drop at the open as option exercises are resolved. I know more than one analyst was suggesting any opening dip on Tuesday would be a buying opportunity. I would go along with that theory simply because we are so oversold but it would only be a short-term trade. We need to focus on Russell-675 as our key indicator. Let the market pick the direction and you pick the trade. Play Editor's Notes & Trading Philosophy for this Week. The definition of a bear market varies depending on whom you are talking to but for most analysts a 15% to 20% decline is usually described as a bear market. 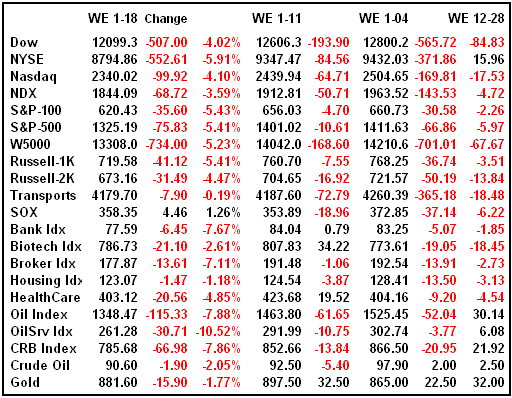 Looking at the numbers in the wrap this weekend you can see that several significant sectors are deep in a bear market and the major indices are there or they're getting close. That means that in a bear market it should be easier to make money on the downside and we need to be looking for new entry points for bearish positions. However, we have just endured the stock market's worst start to a new year in the market's history. We're extremely oversold and due for a bounce. Trying to launch new short or put positions now would probably be foolish. Yet at the same time it's almost unanimous that we haven't hit bottom yet and we haven't seen any market capitulation. Hopefully that will be Tuesday this week or sometime this week. Here is my trading strategy for the time being. We want to be looking for stocks we can buy a bounce and ride for a few days but that's it. Don't get married to them. In reality any bullish play is just an attempt to capture a few dollars while we wait for stocks to roll over again. Investors are going to sell the rallies in a bear market. The only question then is how long will any specific bounce last before it turns into a new entry point for shorts and puts. The pattern to watch for is lower highs and lower lows. Relatively speaking we just hit lower lows so now it's time for a bounce but to lower highs. We're going to try adding some plays this weekend with the expectation that we will see a market capitulation soon and if we're lucky we can get filled on an intraday dip before the oversold bounce begins. More conservative traders will be better off just stepping aside and watching from the sidelines. What we are effectively trying to do is "catch the knife" and it will be easy to get cut if you're not careful. The agriculture-related stocks were big winners in the second half of 2007. Now they're getting punished as investors move to lock in gains. 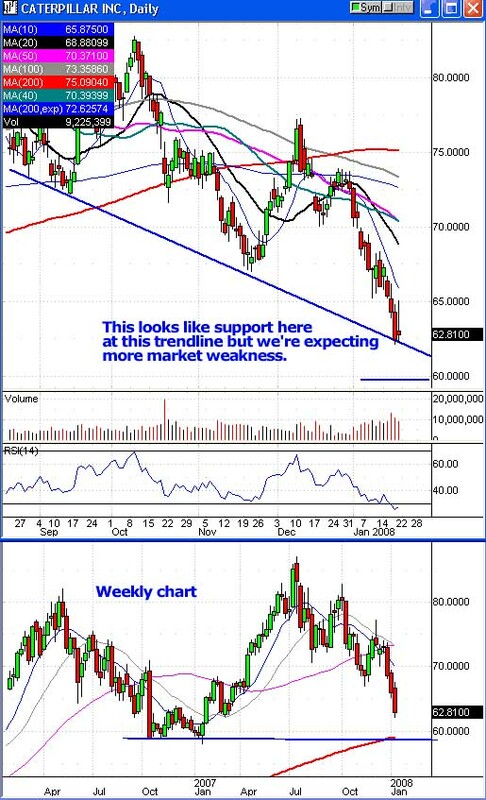 Shares of AG look like they're at support near $55 and the bottom of its gap higher near the November lows. However, these correction moves always seem to get overdone so we suspect there is more profit taking ahead, especially if we see a big market capitulation day. The P&F chart suggests there is support near $53.00, which is close to what should be support at the bottom of its October gap down near $54.00. These would all be levels to watch. 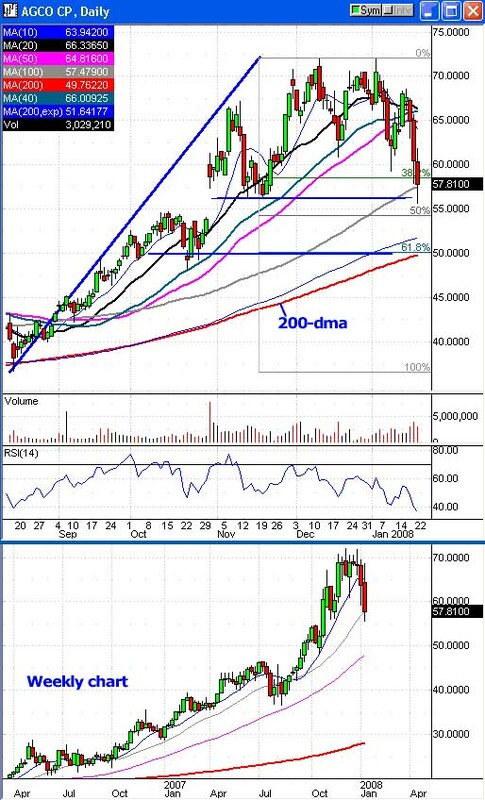 However, the $50.00 level is a natural round-number support area plus it is bolstered by the rising 200-dma. Plus, a pull back to $50 would be a 61.8% Fibonacci retracement of AG's rally from its August lows. We are suggesting that readers look for a dip into the $51.50-50.00 zone as a new bullish entry point to buy calls. This is an attempt to catch a quick but powerful oversold bounce higher. We do not want to hold over the February 7th earnings report. Our initial target will be the $56.00-57.50 range. If AG hits our suggested entry point at $51.50 we're suggesting the February calls. Obviously these will be a lot cheaper when AG hits our trigger. CAT is another agriculture-related stock that is just getting mowed into the ground. There appears to be support near $60.00 so we're suggesting readers buy a dip in the $60.50-59.50 range. If triggered we'll target a quick bounce back into the $64.50-65.00 zone. This has to be quick. If CAT doesn't dip on Tuesday we are dropping it because we have to be out by Thursday night. CAT reports earnings on Friday morning and we do not want to hold over the report. If CAT hits our entry point at $60.50 we are suggesting the February calls. I honestly don't see what sparked the rally in CLF on Friday. My first thought would be "short squeeze" since CLF has higher than normal short interest. 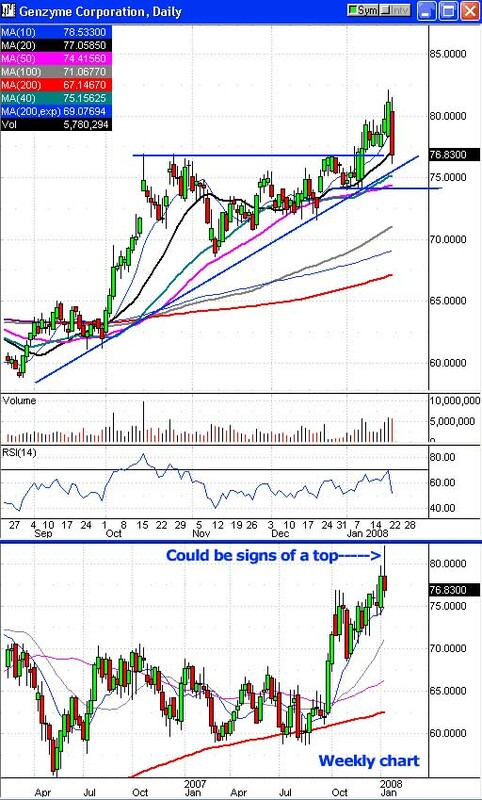 The stock is bouncing from short-term support near $85.00 and it rallied on volume, which is bullish. Given our market wash-out scenario that we're expecting CLF could revisit the $85 level again. This happens to be support on the P&F chart and it also lines up with the trendline of higher lows. We're suggesting readers buy calls on a dip into the $85.50-85.00 zone. If triggered we'll look for a rally into the $92.50-95.00 range. 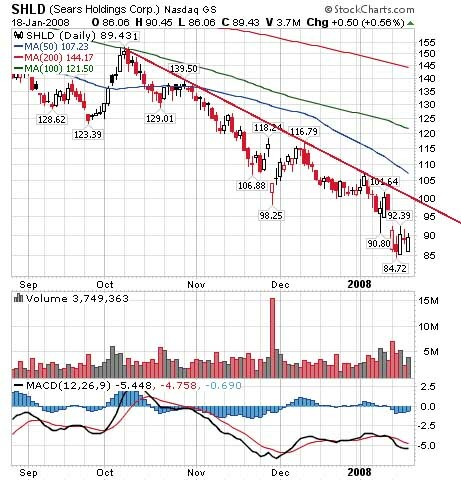 If CLF hits our entry point at $85.50 then we're suggesting the February calls. Shares of FLS, like most of the previous high-flyers, have been getting killed lately. The stock is down 20% from its highs. This looks like support near $80.00 and a tempting entry point. However, if we do get another spike lower we'd rather buy FLS near its 200-dma. Thus we're suggesting readers use a trigger to buy calls on FLS in the $77.00-75.00 range. 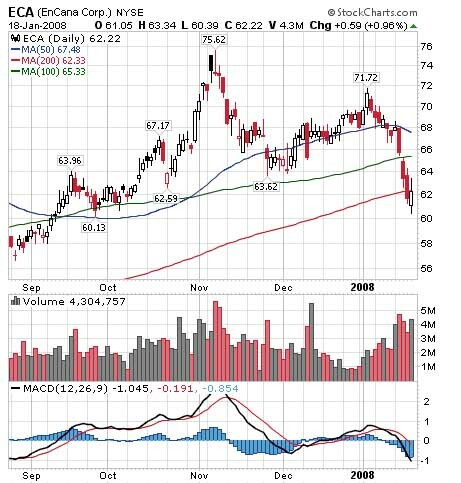 The 200-dma is at $76.65. If triggered our initial target is the $84.00-85.00 zone. 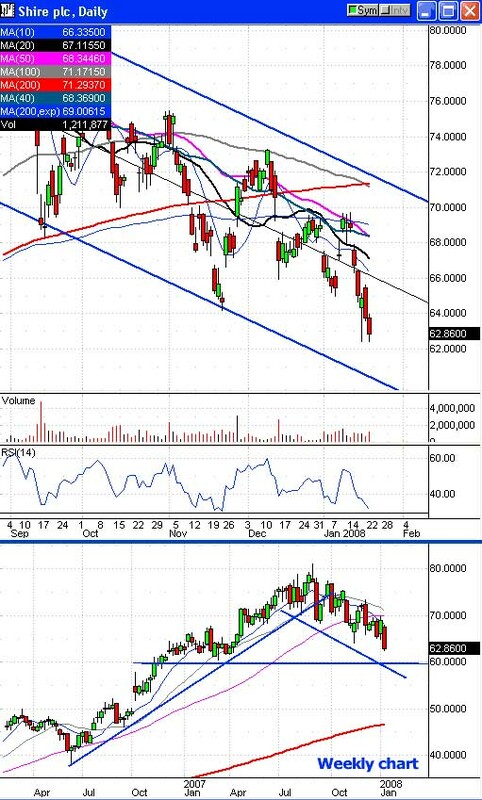 If FLS hits our entry point at $77.00 we are suggesting the February or March calls. We are going to try buying the dip in FWLT again. Last time we were able to catch a quick rebound but shares failed to hit our second target. This time we'll just go for the initial bounce. 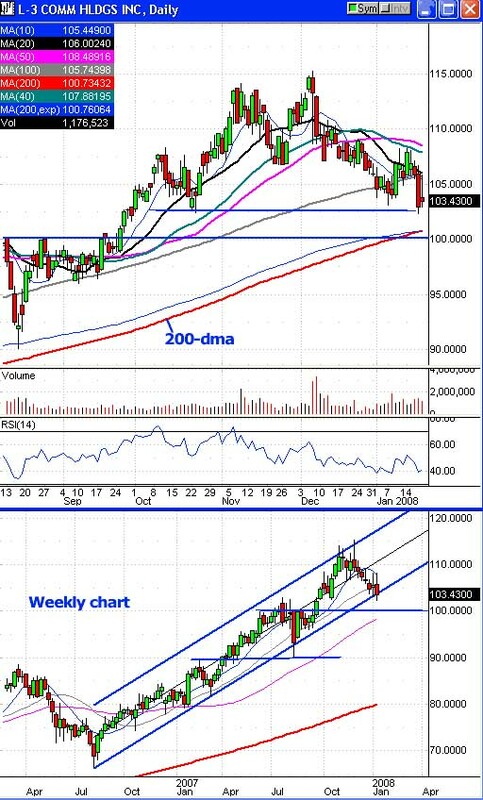 The $120-122 zone looks like support and should be bolstered by its rising 200-dma at $119.50. We are suggesting readers buy a dip in the $123.00-120.00 zone. The closer to $120 the better but last week bulls stepped in at $122.27. 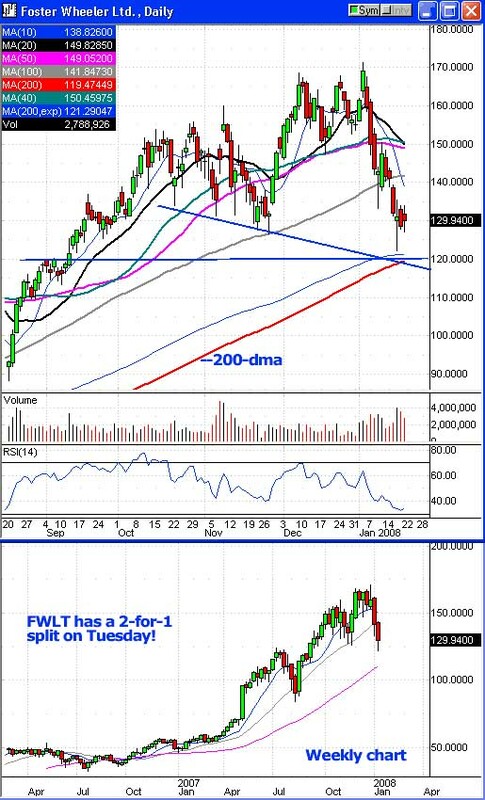 If FWLT hits our trigger at $123.00 our initial target is the $132.50-135.00 range. It is IMPORTANT to note that FWLT should begin trading split adjusted for a 2-for-1 stock split on Tuesday. This means our suggested entry zone will become the $61.50-60.00 range. Our stop will be $59.49. Our target will be $66.25. The option symbols listed today will change due to the split. 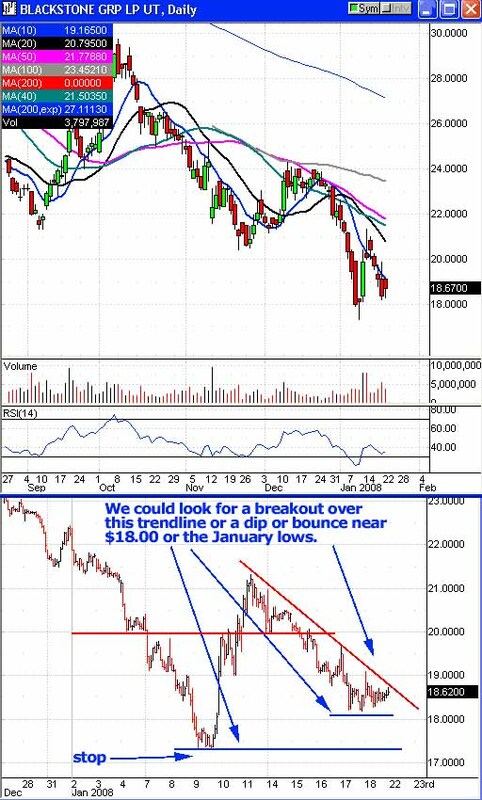 If FWLT hits our trigger (123.00 or $61.50) then we are suggesting the February calls. Shares of HSIC have a very long-term up trend and have been displaying impressive relative strength the past couple of weeks. It would be tempting to open bullish positions now but HSIC has resistance near $63.75. 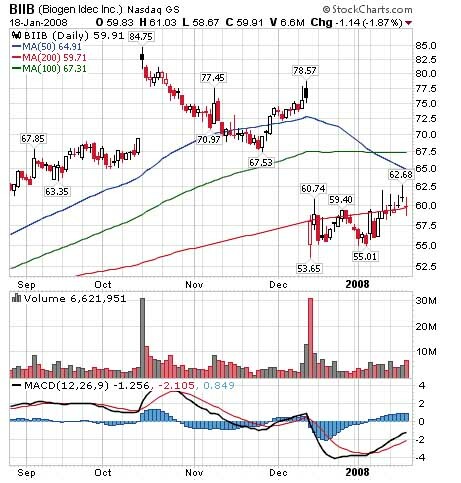 We're suggesting a trigger to buy calls at $64.01. An alternative entry point we will be considering is an intraday dip in the $61.00-60.00 zone. 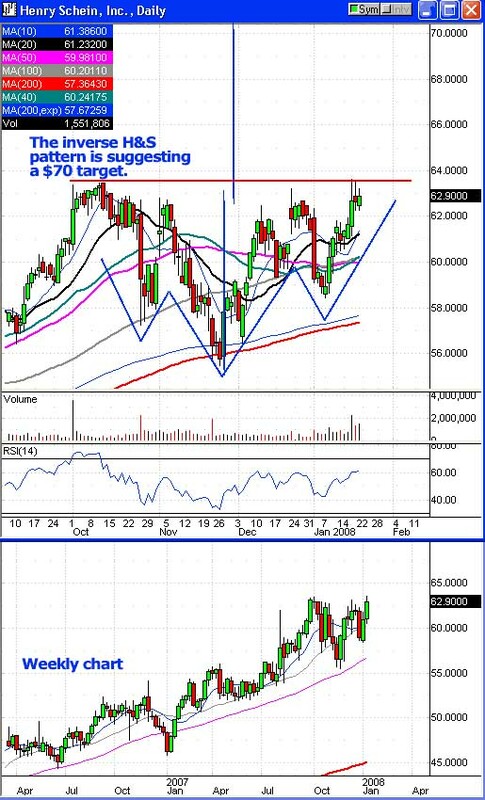 Our target is the $69.00-70.00 range. We are suggesting the February calls if HSIC can hit our trigger at $64.01. LLL has been able to maintain its longer-term bullish up trend even though short-term the stock looks bearish like everything else. 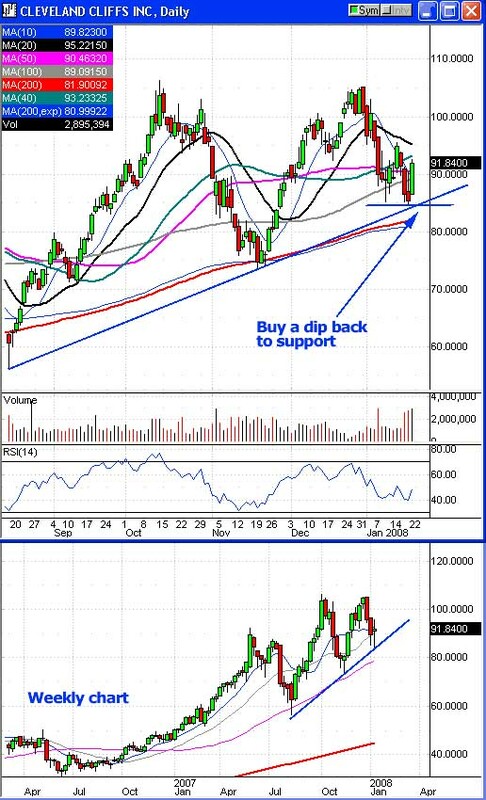 Given the chance a dip near $100 and/or its 200-dma looks like a new bullish entry point to buy calls. 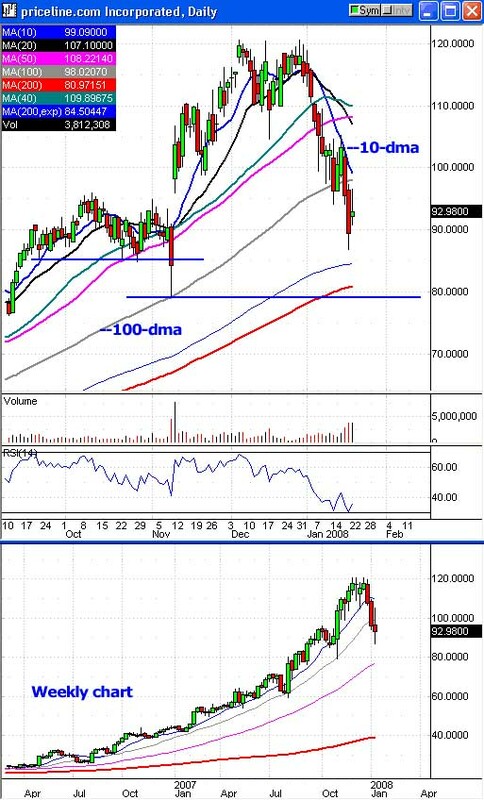 The 200-dma is at $100.75. We're suggesting a trigger to buy calls in the $101.00-99.50 zone. There was an intraday spike down in earl December to $99.87 so we're suggesting a stop at $98.90. 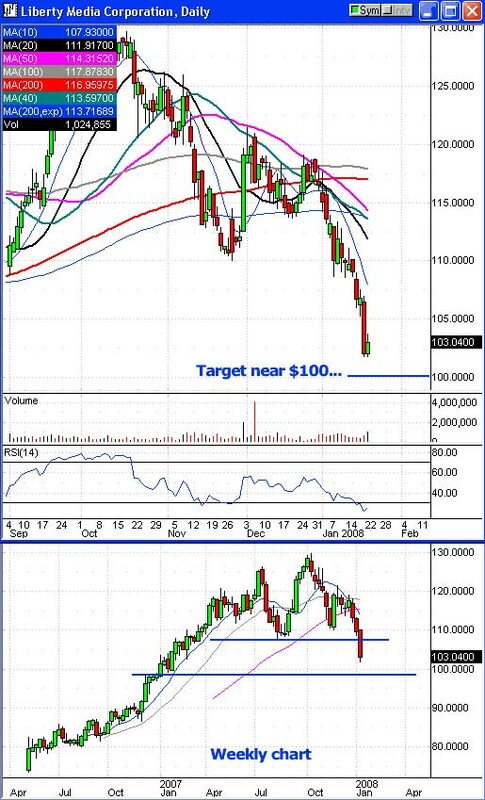 If triggered at $101 our target is the $107.50-108.00 range. We do not want to hold over the late January earnings report. If LLL hits our trigger at $101 we are suggesting the February calls. Shares of BX out performed the market on Friday. The stock managed a minor bounce and posted a 1.6% gain. The trend is still bearish and like we said on Thursday the oversold bounce appears to be dead. The only reason to stay in this play is because both BX and the market itself are so oversold that they could both see a big bounce higher. If we do see a wash-out down day then nimble traders can look for another dip to $18.00 or even $17.50-17.25 near the January lows as a new entry point to buy calls. We do not want to hold over the February earnings report. If BX provides a new entry point we would suggest the February calls. We have been patient and CVD finally came back toward previous resistance near $90.00. We have been suggesting readers use a trigger to buy calls in the $90.50-90.00 zone. CVD dipped to $89.40 on Friday. This should be short-term support and under normal circumstances we would be suggesting new positions right here. 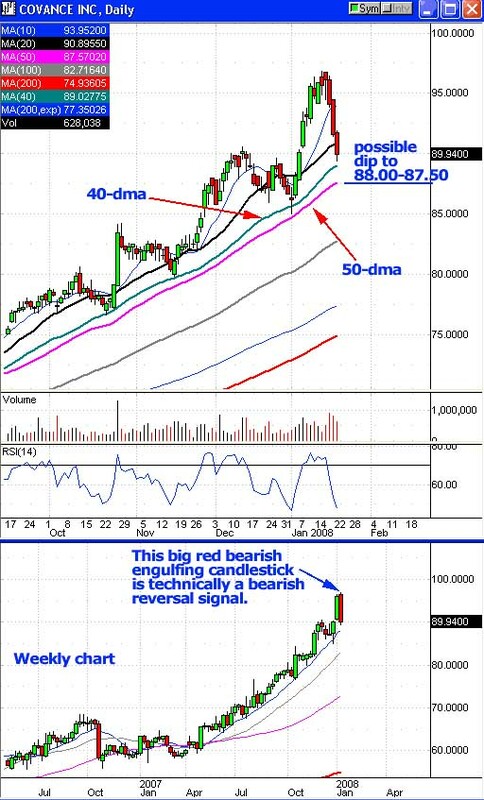 However, we are expecting another market decline so if you're still looking for an entry point then watch for CVD to dip to its rising 50-dma. The 40 and 50-dma has been consistent support in the past. Currently the 50-dma is near $87.57. If you're willing to wait another day or two CVD might provided an entry point in the $88.00-87.50 zone soon. The market has been very volatile lately and just to increase the chances that we don't get stopped out on an intraday dip we're adjusting our stop loss to $86.45 from $86.99. We have two targets. Our first conservative target is $94.50-95.00. Our second, more aggressive target is the $99.00-100.00 range. FYI: We are unfortunately, running low on time. We don't want to hold over earnings. We do not want to hold over the late January earnings report so we are suggesting the February calls. It is normally a sign that we're nearing the bottom when investors start selling their winners. As of Thursday GENZ was hitting new highs but the stock got hammered on Friday for 5.3% loss as traders panicked to lock in a gain during the market weakness. A bounce from here near $76.00 would be a new bullish entry point. 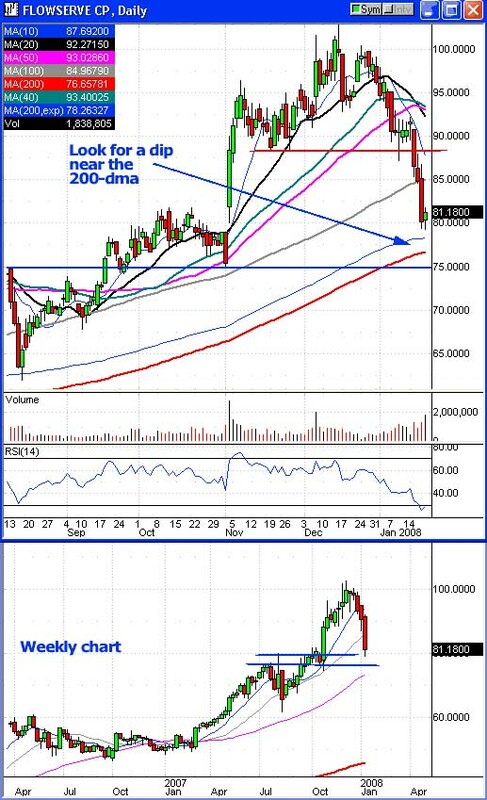 However, if we do see a capitulation move this week then GENZ could dip to $75.00 and its 50-dma or even previous January support near $74.00. More aggressive traders might want to consider placing their stop loss under $74.00. Our target is the $84.00-85.00 range. I would actually consider a second, more aggressive target in the $88-90 zone. The P&F chart looks very bullish with a $94 target. FYI: Any time we play a biotech company it is always a high-risk play due to headline risk. You never know what news might come out concerning an important FDA decision or clinical trial that could dramatically move the stock price and see shares gap one way or the other. We are suggesting the February or March calls but remember that we want to exit ahead of the February earnings report. Readers might want to do a little profit taking if Friday's action in LCAPA sees any follow through. The stock found support near $101.75 and performed a mini double-bottom intraday. Shares look poised to bounce back to $105 or higher. On the other hand this could be a speed bump on the way to $100 if we do see a market wash out next week. We're not suggesting new positions at this time. More conservative traders could try and inch down their stop to the 10-dma. Our target is the $100.25-100.00 range. The P&F chart is bearish with a $98 target. Warning: We cannot find an earnings report date for LCAPA but the company appears to have a history of reporting in February. Not knowing when they report is a risk since we don't want to hold over the event. We are not suggesting new put positions in LCAPA at this time. Hmm... PCLN displayed some relative strength on Friday. The stock got an upgrade Friday morning. A Citigroup analyst raised their rating to a "buy" claiming that PCLN was recession-resistant due to the high volume of business from overseas. The trend is still bearish but we hesitate to open new positions here and without a doubt the stock price has been very volatile lately. Our target is the $82.50-80.00 range. More conservative traders will want to consider exiting near $85.00. We do not want to hold over the mid February earnings report. We are not suggesting new positions in PCLN at this time. SHPGY dipped to $62.41 on Friday. It's close but not close enough to our second target in the $62.00-60.00 range. Readers may still want to consider locking in a profit right here. However, if we do see another big down day on Tuesday this week then SHPGY might plunge to the $60 region. We're not suggesting new positions in SHPGY at this time. The stock has already hit our first target near $65. We are not suggesting new positions in SHPGY at this time. We're closing SHLD as a current play. We remain very bearish on the stock but we're just not getting any entry points. We're not counting it as a win because shares gapped down on us. Right now we would be look for a failed rally near $95.00 or $100.00 as a potential entry point for new bearish plays. What did I tell you? After BIIB's failure to move on the FDA news last Monday I speculated that BIIB would be pinned to the $60 level thanks to options expiration. The lack of a reaction to the FDA news killed our speculative strangle play. Unfortunately, our high-risk/reward strangle on ECA failed to perform. Our options expired worthless. The options we listed for the strangle were the January $75 calls (ECA-AO) and the January $60 puts (ECA-ML). Our estimated cost is $0.65. Today's Newsletter Notes: Market Wrap by Jim Brown and all other plays and content by the Option Investor staff.